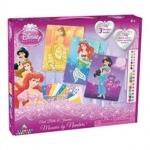 Jordanna was sent the Disney Princess Sticky Mosaics kit from Cre8ive Kidz. She was absolutely delighted when it arrived because as like most little girls she loves anything to do with Disney Princess and also enjoys making things. The kit contains 3 boards of Ariel, Belle and Jasmine, 1300 sticky mosaic jewels and tiles plus 3 plastic hangers for display. On each Princess are lots of empty squares. Each square has a number and each number represents a different mosaic- either a tile or jewel.
. Jordanna had to work out which tile went where by following the enclosed chart which showed her which piece was which. 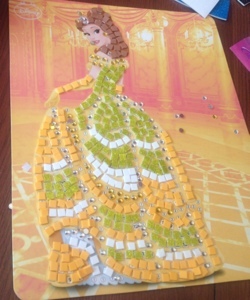 She started with Princess Belle and quickly got the hang of it. The sticky tiles are small but come off the sheet very easily and the numbers on the board are clear to see. Each Princess board measures 25.4cm x 30cm and once finished can be hung using the enclosed plastic hangers so your little princess can proudly hang her Disney Princess in her room. The kits can be purchased here for £14. Cr8ive Kidz is a family run business specialising in children’s arts and crafts. Their products aim to develop vital learning skills aswel as fun and aid towards hand to eye co-ordination skills and imaginative play. They have a range of award winning environmentally friendly toys and are constantly updating their range. Jordanna really enjoyed completing the princess pictures and she has almost finished her second one. This kit would be great for school holidays on rainy days when kids get bored. Would also make a nice birthday present or even Christmas present- if like me you start your Christmas purchases very early.